Journey through J.R.R. 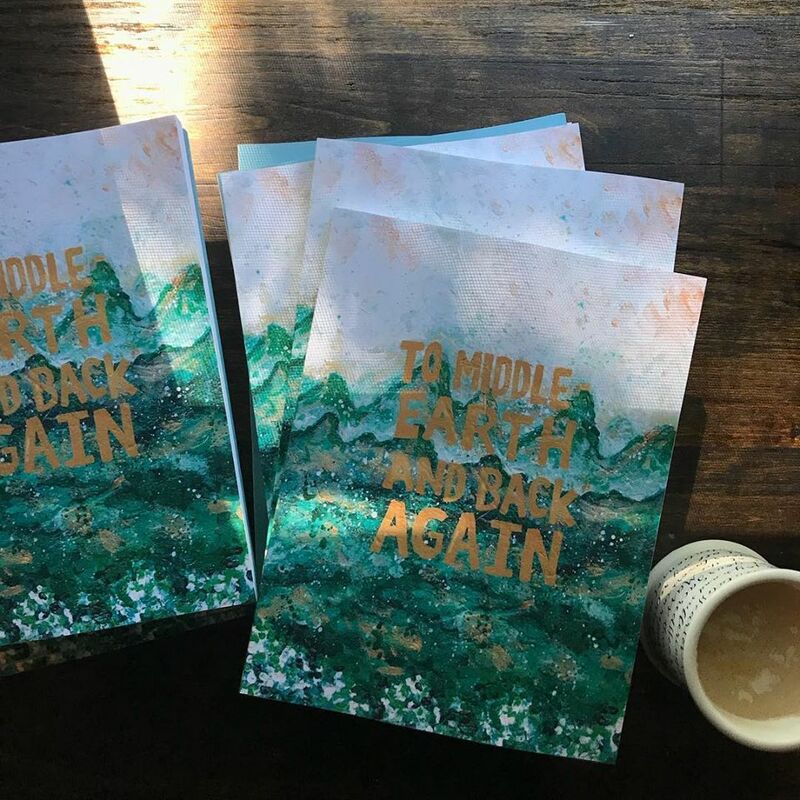 Tolkien's Middle-Earth and back again with this new companion journal and devotional by Tea with Tolkien. Chapter by chapter, grow in Hobbit-ness and Holiness as you reflect on major themes, quotes, and characters from The Lord of the Rings. This workbook journal explores Tolkien's Catholic faith and the influence it had on his writings, inspiring you to reflection and action as we seek to carry the spirit of Middle-Earth into our own daily lives through journaling prompts, discussion topics, and tangible action items. Journey alongside Frodo, Samwise, and the other members of the Fellowship of the Ring as they each play their parts in the War of the Ring; and as they come to the final chapters of their tale, you may find yourself altogether changed as well. For each chapter of The Lord of the Rings, this workbook includes: a chapter summary; space for note-taking; a short reflection on a theme, quote, or character; and discussion and/or reflection prompts. This workbook also features several "On the Road" bonus sections concerning certain characters and events, such as Tom Bombadil and the Gifts of Galadriel, where we can take the time to dig deeper into Tolkien's legendarium. Ships within the US only, sorry! If you’ve been reading along for a while, you might have seen me talking about the book club companion journals I had written to accompany The Fellowship of the Ring, The Two Towers, and The Return of the King. After selling out of those initial journals, I knew I wanted to publish a second, even better edition. I’ve compiled everything from the journals into one beautiful workbook! It’s 180 pages of chapter summaries, reflections, discussion questions, and journaling space! And featuring cover art by the amazingly talented Haleigh DeRocher of Sweet Sequels! So many of you have been asking what exactly this book is about, so I wanted to take a few minutes to talk a bit more about it! Its purpose is twofold: first, I wanted to create a companion that would help you stay on track as you read through The Lord of the Rings, especially if it’s your first time; second, I wanted to not only help you through the story itself, but to help you to dig deeper into its themes and applicabilities. I wanted to walk alongside you as you journey through Middle-Earth. I’ve heard from so many friends that they’ve wanted to read The Lord of the Rings but weren’t able to make it through for one reason or another, and if you’re feeling the same way, this book is for you. What does the book include exactly? Do I have to be Catholic to read this book? No! This book is meant for anyone who wants to grow in “Hobbitness and Holiness”. We do discuss different elements of Tolkien’s Catholic faith and their influence on The Lord of the Rings, so there are definitely some very Catholic elements to it, but I dearly hope all of my brothers and sisters in Christ would love this book! I see it more as getting to know the worldview behind the story, which I find very helpful in understanding The Lord of the Rings as a whole. What age group is this book for? Would this be appropriate for my teenager? I’ve written it for anyone who might be reading The Lord of the Rings (so probably anywhere from 13+). I think this book would be a great tool for parents and teens to work through together, as I’m imagining it would provide many opportunities for great family discussion! I’ve never read LOTR before. Will I be totally lost? No! This book is meant to be a companion to guide you through The Lord of the Rings - it should be especially helpful if this is your first time reading through it! I’ve written a summary of each chapter to help with reading comprehension, as well as reflections to help you dig deeper into the material. Is this better for a personal read-through, or a group setting? This book can be used for both! Reflection questions are great for personal journaling or group discussion. If you’re planning to read in a group of 10 or more, please get in touch with me for a group discount. How can I order? The book is currently available for shipment within the US via amazon. Why can’t I order outside of the US? Many of you have also asked about when the book will be available outside of the US. Currently, I’m only legally allowed to print and ship within the United States but after I’ve finished raising the funds for the US fee I will begin the process of speaking with Tolkien’s publishers in other countries. Because this is a bit of a long, drawn-out process, I’m not expecting to have this finished until sometime next year.